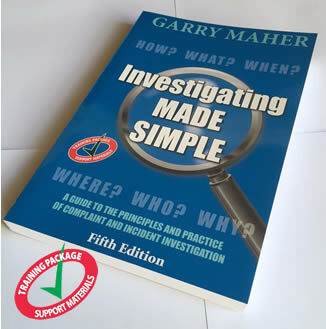 ASSI is the exclusive distributor of the Fifth Edition of the very popular government-endorsed textbook Investigating MADE SIMPLE by renowned author Garry Maher. Garry is a former police officer, corporate trainer and academic and he published this sought-after book in response to requests from academics, trainers, students and investigation practitioners following the rapid sell-out of the previous editions of this unique book. Garry's book is the result of his extensive experience and research into contemporary investigation best practice and a well-recognised need in the investigation profession for a comprehensive, easy to understand guide to the principles and practice of complaint and incident investigation. Garry has taken great pains to convey to the reader "I can relate to that" approach to his writing style. His minimal use of legalese together with a clever mix of cartoons, clichés, and real-life anecdotes, makes for entertaining, yet informative reading. Garry's reader-friendly style of writing, humour, practical hints and his skill in explaining complex issues in a logical and realistic way will appeal to professionals, students and people interested in the investigation process. Numerous government and corporate entities have endorsed the textbook Investigating MADE SIMPLE as Training Package Support Material identified by the ‘noted tick’ logo. Investigating MADE SIMPLEsupports a wide range of core and elective units of competency in a number of accredited investigation and related training packages under the Australian Qualifications Framework. Investigating MADE SIMPLE is an ideal reference for those people wishing to update their knowledge base on investigation best practice or who are seeking academic status based on recognition of prior learning (RPL) or recognition of current competencies (RCC).